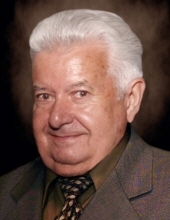 Anthony L. “Tony” Simone age 87 of Midland died Saturday afernoon March 23, 2019 at Brittney Manor. He was born on October 8, 1931 in Three Rivers, son of the late Rudolph and Edith (Cunico) Simone. Tony married the former Antoinette A. “Toni” Giannini on December 1, 1952 in Detroit. She died on May 15, 2013. Tony grew up in Detroit, attending Pershing High School where he was part of the R.O.T.C. Program. He graduated in 1949 and left for the U.S. Marine Corps that year where he served until 1953 during the Korean Conflict. While in the service he served with his buddy, hunting buddy and soon to be brother in law, Jack Giannini. While in high school he worked for Hackett Brass as a core maker. He was a reserve police officer in Warren, Michigan. Tony was also a personal director and loss prevention director for Wolohan Lumber, Great Scott, Arnold’s Drug Store and Allied Supermarkets. He was also part of the Knights of Columbus, Warren Branch, 4th degree and the Frankenmuth Woodcarvers. He enjoyed smoking meats, feeding the wildlife, was a avid Detroit Lions fan, woodcarving, painting, hunting, smelt fishing, target shooting and his beloved beagles “Scooby” and “Sam”. He is survived by his children; Anthony Simone, Jr. of Midland, Rocco (Donna) Simone of Saginaw, Jerry (Carol) Simone of Yale, Sandra (Ken) Kutler of Leonard and Jeff (Michelle) Simone of Midland. He is also survived by grandchildren; Eric Simone, Brad (Jennifer) Kutler, Gerad (Krystin) Kutler, Mariah Simone, Sahara Brisson, Brendan Simone, Nicoli Simone, Makenna Simone and Alyssa (Ryan) Huffman (Stahlbusch). Tony is also survived by great grandchildren; Mason and Addison, Evie Joshua and Cecilia Kutler, Gabriel Huffman, Braxton, Ava and Maelynn Curnow and Maximus Nyquist. Also surviving are brothers’ Jim (Shirley) Simone of Lake Orion and Frank (Anne) Simone of Algonac. In addition to his parents and wife Tony was preceded in death by his granddaughter Kayla Curnow and brother-in-law Jack Giannini. The funeral liturgy will be celebrated at 11:00 A.M. Thursday, March 28, 2019 from St. Brigid of Kildare Catholic Church with Father T.J. Fleming as celebrant. Tony’s family will receive friends at the Ware-Smith-Woolever Funeral Home, 1200 W. Wheeler Street on Wednesday from 4-8 P.M. and at the church on Thursday from 10:00 A.M. until time of Mass. At 8:00 P.M. the rosary will be prayed. Entombment for Tony will take place at 11:00 A.M. Friday March 29, 2019 at Resurrection Cemetery, Clinton Township, Detroit. Those planning an expression of sympathy are asked to consider St. Brigid’s Catholic Church or St. Jude Children’s Hospital. Full military honors will be presented by the Midland Area Veterans and the U.S. Marine Corps. To plant a tree in memory of Anthony "Tony" Simone, please visit our Tribute Store. "Email Address" would like to share the life celebration of Anthony "Tony" Simone. Click on the "link" to go to share a favorite memory or leave a condolence message for the family.